What is Irregular Migration? How is it different from Asylum Seeking? If you want to get the basic tools and terminology as well as learn more about what happens at the global level through case studies and expert interviews: Enrol now! This course provides a general introduction to the conditions of refugees, asylum seekers and irregular migrants worldwide (data, regions, etc.) and an overview of the terminology used. It then analyses specific cases in the most relevant geographical contexts, including the asylum seekers arriving in Europe through the Mediterranean, the undocumented Mexican migrants crossing the US border, the Syrian refugees in Turkey and the Rohingya in Australia. In discussing these cases, we will explore the dilemmas behind humanitarian protection and irregular migration for labour purposes. The course is based on video lectures, didactic videos and podcast interviews with international experts. Assignments consist of short quizzes for each unit and a journal exercise at the end of the course. Suggestions for further reading will be included in order to achieve a more in-depth understanding. - discuss possible future scenarios and the social challenges posed by these migrations. This course is meant as a general introduction to migration issues for students and practitioners. Knowledge of English language is essential. Previous knowledge of basic sociological or economic debates can be an advantage, although this is not a compulsory prerequisite. The only other requirement is enthusiasm and interest in the topic. Unit 1.1 – What are irregular migration and asylum? Unit 1.2 – Let us talk about words! 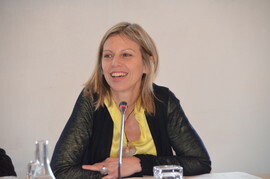 Prof. Anna Triandafyllidou is the Director ad Interim of the Global Governance Programme of the Robert Schuman Centre for Advanced Studies and the Director of the GGP Research Strand on Cultural Pluralism at the European University Institute (EUI). She received her PhD from the EUI in 1995. In 2001, she was a Fulbright Scholar at NYU. Her main areas of research are migration, nationalism, European integration, media and discourse studies. She has published over 20 books and authored over 100 articles. Her most recent book is What is Europe? (London, Palgrave, 2015) and the Routledge Handbook on Immigrant and Refugee Studies (Routledge, 2016). For more information about Prof. Triandafyllidou, follow the link to view her full profile.